If you are already a DIRECTV for BUSINESS customer, you have earned reward credits for the DIRECTV MVP Marketing Program. Any remaining credits you have will be rolling off at the end of the year. Starting January 1, 2017 your reward credits will be updated with new reward credits based on the packages you subscribed to in the last year. DIRECTV provides its commercial customers with an incredible marketing resource. The MVP Marketing website includes promotional materials like Banners, Posters, Coasters, and much more that you can obtain with reward credits. By being a DIRECTV business customer, you are automatically enrolled in the MVP Marketing Program credit program. For a DIRECTV base package, you will receive 200 rewards credits. For NFL Sunday Ticket, you will receive 200 reward credits. For each additional sports package, you will receive 100-150 reward credits. You can also purchase promotional items at deeply discounted prices. 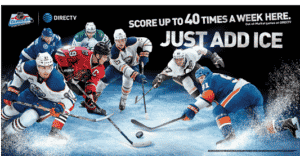 A great example of that is right now this 8 foot NHL CENTER ICE promotional banner is just 15 credits or $15.00 on the DIRECTV MVP Marketing website. 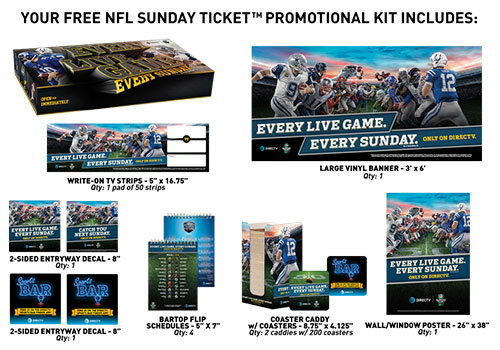 The MVP Marketing Program also includes FREE Promotional Kits for special sports programming subscriptions like NFL SUNDAY TICKET, ESPN College Extra, NBA League Pass, MLB Extra Innings, NHL CENTER ICE, Fox Regional Sports Networks, and other packages and sports. Ever wondered what sporting events are on TV and what DIRECTV channel you can find them on? 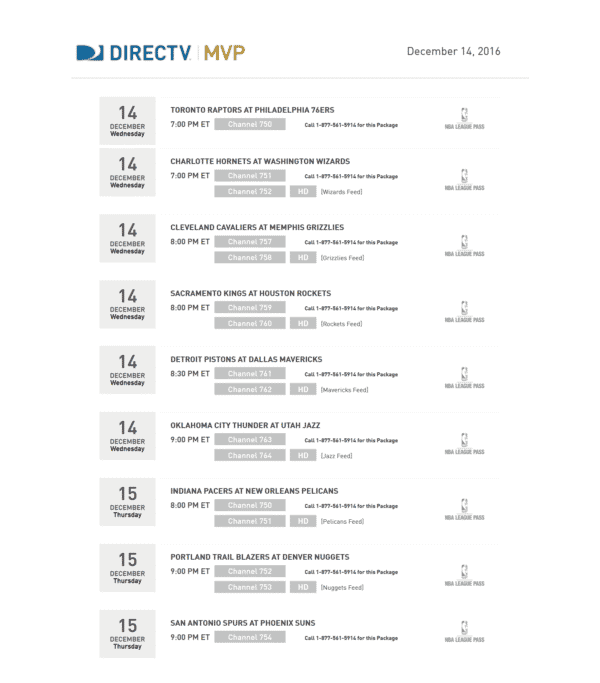 The DIRECTV MVP Marketing Program gives you access to a searchable and printable sports schedule. Print it out daily so you and your bar and restaurant staff can know what games are on and what channel they are on when a customer asks. Business Circle is an online resource and forum where business owners like you can find solutions to the challenges you are facing and inspiration as well as connect with your peers and with industry experts. Visit the new Business Circle page on directvmvp.com/businesscircle today! The College Football Playoff is around the corner! 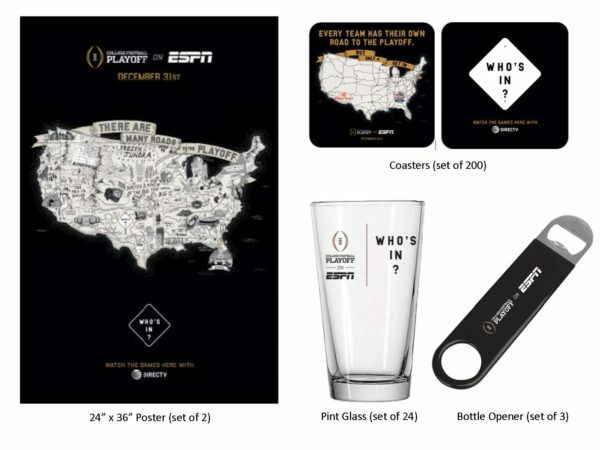 The DIRECTV MVP Marketing Program has the promotional materials and other merchandise you need to show your customers that the ESPN College Football Playoff will be on your TVs. Make sure they know your Bar or Restaurant is the place to watch all the excitement on New Year’s Eve! If you have any questions about the DIRECTV MVP Marketing Program or how to redeem your credits, call Barry at 800-951-1979 today. 4K Equipment may be available for your business. Call us today for more information.